The Dandi Orchestra is a Calgary-based ensemble that features the vocal talents of its two founders: Doug McKeag and Onalea Gilbertson. The ensemble has played in a wide variety of venues in Calgary and Banff, and is available in several different configurations, from 5 to 15 musicians. Over the years, the Dandi Orchestra has created custom concert-shows for: Calgary Opera; The Calgary Homeless Foundation; Ducks Unlimited International Convention; FirstEnergy; Theatre Junction; The Forzani Group; The Canadian Chiropractors’ Association. From the most intimate settings to full-blown spectacles, the Dandi Orchestra specializes in that glorious Big Band sound of the 30’s, 40’s and 50’s, and captures those eras in look and sound. Co-leaders Doug and Onalea always create a fun and stylish atmosphere, providing solid entertainment that is Elegant, Timeless and Appropriate. The 10-piece Dandi Orchestra features piano, bass, drums, guitar, percussion, 2 trumpets, 2 saxes and trombone. This enemble is perfect for cocktails, dinner and dancing as well as customizing your own original show. Ideal for large scale special events. 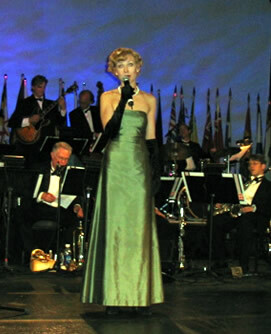 Repertoire is big band music from the 1940's - 1960's. The Dandi Sextet: This configuration features piano, bass, drums, guitar, trumpet and sax. This is an ideal unit for medium size events for cocktails, dinner and dancing. Repertoire is music from the 1940's to the 1960's. ***Both ensembles are available with Onalea as a solo vocalist or with both Onalea and Doug McKeag on vocals.